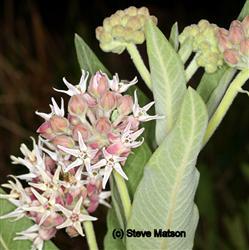 Showy Milkweed is a perennial, with 3' tall stems and large gray 5" leaves, and clusters of rose pink flowers. It is another ‘must’ for a butterfly garden. During the summer it is covered with monarch caterpillars. It needs sun, is quite drought tolerant, and tolerates alkaline soils. The pollen has self-incompatible alkaloids that give the butterflies that feed on it protection. Alkaloids from the wrong milkweed can expose the butterflies to predation. If the monarch or other butterfly has not evolved with the milkweed they have no tolerance for the particular alkaloid of the species.